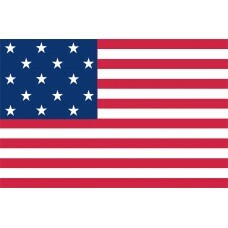 Shop for authentic replica Star Spangled Banner flags. Our Star Spangled Banner flags are constructed of durable nylon with a canvas heading and offered in five sizes. The Star Spangled Banner is the name given to the national flag of the United States of America. Famous across the world, the name is also given to the country's national anthem. While the modern design of the flag is very well known, in fact its original form was slightly different to today's. The original Star Spangled Banner had 15 alternate red and white horizontal bands, and a canton with 15 white stars picked out on a dark blue background. The original Banner was also known as the Garrison Flag. It was flown above Fort McHenry on Locust Point in Baltimore during the War of 1812. This conflict is not one of the most well known in discussions of United States history but was an important part of the country's development. In Europe, the War of 1812 is considered one of the many Napoleonic Wars which dominated that continent in the late 18th and early 19th Centuries. From a North American perspective, the War of 1812 was much more significant. Both the United States of America and Canada view the conflict as one which helped settle borders and national control. The original Star Spangled Banner was enormous. It measured 30 feet (9.1 meters) in height and 42 feet (12.8 meters) wide. It was part of a pair of flags ordered to fly over Baltimore during the conflict. The other flag was called the Storm Flag and was much smaller and less hard wearing. They were ordered by George Armistead, the commander of Fort McHenry. Mary Young Pickersgill was the local Baltimore craftswoman commissioned to make the flags. Armistead had asked for a particularly large flag which could be seen across Baltimore Harbor. 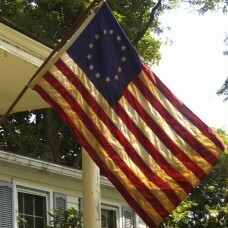 Each of the stars on the Garrison Flag was two feet wide and high. They were arranged in five offset rows of three stars each. The inclusion of 15 stars and stripes on the Star Spangled Banner was due to the inclusion of Kentucky and Vermont into the Union. The addition of new states on the national flag would later be banned by Congress, but in 1812 the practice still persisted. Mary Pickersgill created the Garrison Flag from cotton and wool bunting from England. She was helped by her daughter and an indentured African American servant. The flag suffered serious damage during the Battle of Baltimore. This naval and land battle was a success for the Continental forces and disrupted British plans to overtake the city. This gave Baltimore residents and military personnel vital time to make the city secure. Eventually, the British abandoned their plans to retake territory in the region. The Garrison Flag inspired Frederick, Maryland lawyer Francis Scott Key to compose a poem called Defense of Fort M'Henry. This was later re titled The Star Spangled Banner, which was the last line of its first verse. The poem was later set to music by British composer John Stafford Smith and became the national anthem we all know today.